Amid Brutal Campaign, a Respite. With Jokes. President Obama and Mitt Romney finally found something they could agree on during Thursday night’s 67th annual Al Smith white-tie charity dinner: Jokes about Vice President Joseph R. Biden Jr. get big laughs. 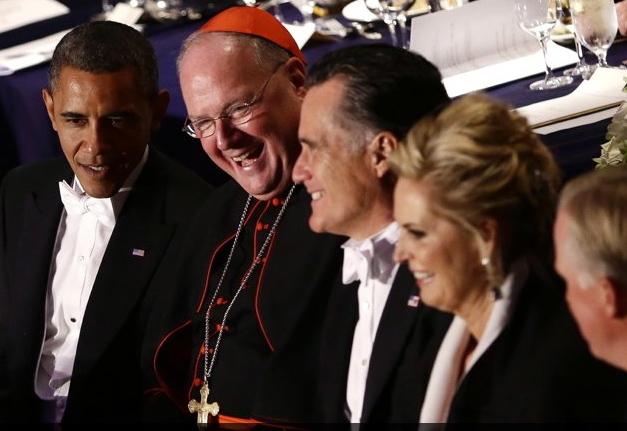 In a campaign notable for the contempt in which Mr. Romney and Mr. Obama at times seem to hold each other, the dinner at the Waldorf-Astoria to benefit Catholic charities — one of the quadrennial proving grounds on the road to the White House — also lived up to its other billing: a respite, however brief, from a campaign that has grown nastier as it has grown closer, illustrated just a few nights ago during a heated, in-your-face debate at Hofstra University. The equally skillful performances on Thursday night of Mr. Obama and Mr. Romney almost seemed jarring for how civil and self-deprecating each could be in the other’s presence — even as they lacerated their rivals’ campaign missteps. “We were chatting pleasantly this evening as if Tuesday night never happened,” Mr. Romney said. “I have to say I am impressed with how well Governor Romney has avoided that problem,” he said. This entry has been viewed 278 times.